Olive Garden’s most popular promotion – Never Ending Pasta Bowl – is back for the 19th year, and this time it’s layering on its first-ever cause marketing promotion. 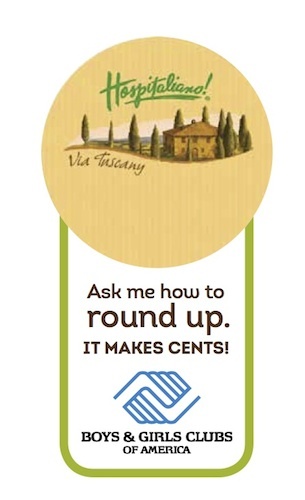 The Olive Garden is asking guests to round up their checks in support of the Boys & Girls Clubs of America through November 9th. To kick off the campaign, 700 Olive Garden restaurants surprised kids at their local BGCA clubs with pasta, breadsticks and salad. According to Chad Royal-Pascoe, National VP of Corporate and Cause Partnerships at BGCA, it was critical to keep this campaign simple and streamlined for Olive Garden employees and non-intrusive for Olive Garden customers. Here’s how they accomplished both: Customers are greeted by a banner announcing the partnership when they enter the restaurant. Their server will be wearing a ribbon reminding them to round-up (shown at right). When presented with their bill, diners will see an info card about the campaign (shown below) as well as a line item on the receipt itself for consumers to add in a donation amount. Visible and simple yet low pressure. We’re excited to see what this first-year effort will reap for both company and cause!